The exhibition hosted by the Nelson Mandela Metropolitan Art Museum in celebration of Heritage month, forms part of an international art project that was designed to bring attention to the fragile marine environment which is currently threatened by pollution, excessive fishing, and encroaching human development and industry. 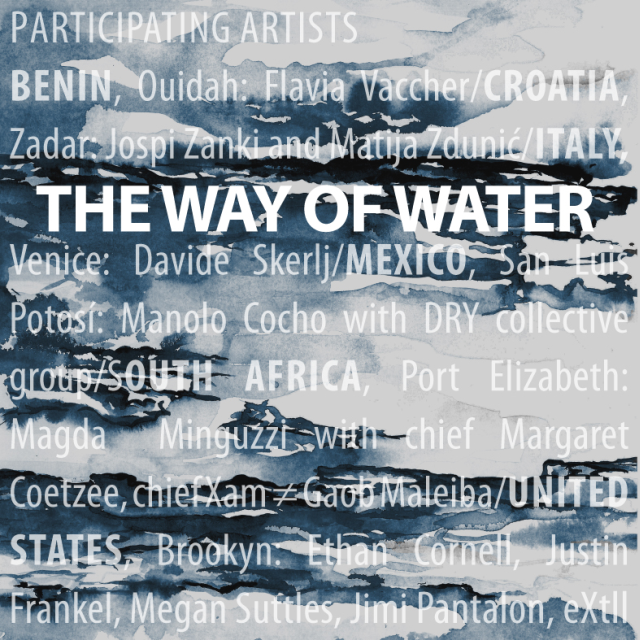 On the 5th and 6th of May, 11 artists and art collectives from 6 countries across the globe produced simultaneous art performances that focused on water environmental issues pertinent to each location. These performances were recorded through photographs and videos for exhibition. The Nelson Mandela bay leg of this exhibition features an art performance produced by artist Dr Magda Minguzzi in conjunction with Chief Margaret Coetzee and Chief Xam ? Gaob Maleiba representing the Khoi Khoi community of Nelson Mandela Bay. Dr Minguzzi was assisted by Ernst Struwig and Lucy Vooslo. The performance took place at the sacred KhoiSan and Khoi-Khoi fish traps located in the Cape Recife Nature Reserve. Alongside the fish traps are ancient structures believed to be constructed by the Strandlopers from whom the KhoiKhoi people are descended. The location was selected due to its significance as a unique heritage site. On the day of the performance, Chief Margaret Coetzee and Chief Xam ? Gaob Maleiba along with other members of the Khoi Khoi community lead the participants in a traditional Khoi Khoi cleansing ceremony. The traditional ceremony was a reminder that before pollution and exploitation of the sea, human beings lived in harmony with Mother Earth and respected the sea. Members of the public who had an interest in preserving and celebrating the fragile marine ecosystem of Nelson Mandela Bay were invited to participate in the ceremony. The day ended with the participants making a fire which is an ancestral symbol of gathering and communal meeting. Participating artists: Benin, Ouidah: Flavia Vaccher /Croatia, Zadar: Jospi Zanki and Matija Zdunic/Italy, Venice: Davide Skerlj/Mexico , San Luis Potosí:Manolo Cocho with DRY collective group/South Africa , Port Elizabeth: Magda Minguzzi with Chief Margaret Coetzee and Chief Xam ? Gaob Maleiba /United States , Brookyn: Ethan Cornell, Justin Frankel, Megan Suttles, Jimi Pantalon, eXtll. Juliet contemporary art magazine, University of Trieste (Italy), Hdlu Croatian visual artist association. The Nelson Mandela University, AEON-ESSRI (Africa Earth Observatory Network, Earth Stewardship, Science, Research Institute), Nelson Mandela Bay Arts Culture Heritage Department and Municipality as well the Pine Lodge, supported the project.